Where did Joseph Smith get his seer-stone? Seer-stones did not originate with Mormonism, and Joseph Smith was not the only person using a seer-stone during his lifetime. Simply put, historically a “seer-stone” was — as the name implies — a rock through which someone was able to “see” something. Usually (but not always) it was believed that the rock itself had an innate, special quality that made this power possible. Seer-stones were used by early Americans to find lost objects, see far away places, predict the future, or find the location of buried treasure. In fact, Joseph Smith met his wife Emma Hale because he had been hired to travel o to Pennsylvania to assist a search for a lost silver mine using his gift with a seer-stone. 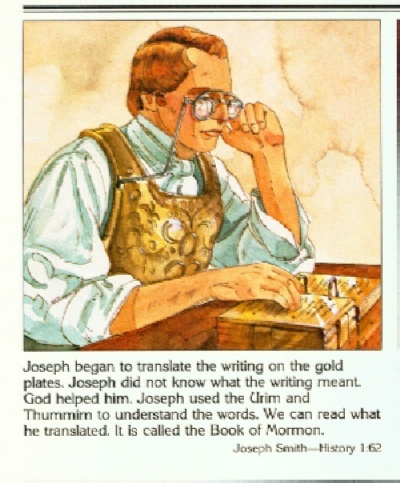 Joseph had been recruited because, according to Joseph’s mother, he had the reputation of being gifted to see hidden or buried things with his seer-stone. Historical records on the use of seer-stones are hazy; in America there is virtually no account of their use until the early 1800s, and from then until approximately 1830 the accounts of seer-stones occur exclusively in western New York (elsewhere in America people seem to have preferred “divining rods,” which were used in a similar). In other words, the region that Joseph Smith grew up in seems to have been the only place in America where seer-stones were used regularly. Before Joseph Smith’s family moved to western New York, these stones were already beijg used by people in that region to find lost objects, see far away places, predict the future, and, especially, to identify the location of buried treasure. The method through which this was done was simple. The seer would usually place the stone in his or her hat in order to exclude the light, and while gazing into the stone at the bottom of the dark hat the seer was capable of seeing what they desired. Almost all reports say that Joseph Smith did the same with his own seer-stones, even while translating the Book of Mormon and while receiving some of the revelations recorded in the Doctrine and Covenants. In western New York these seers were often youth and could be either male or female. Girls seem to have sometimes been considered more specially gifted with seer-stones, and during Joseph Smith’s youth the most popular local seer was a neighbor girl in Palmyra named Sally Chase, and in fact she may be the one who first introduced Joseph Smith to the idea of seer-stones. The use of seer-stones in western New York was so common-place that, according to one resident, a neighbor woman came to her house and asked if she could borrow their “peep-stone,” as if asking for a cup of sugar, in order to find some lost object. Are “seer-stones” different from an “Urim and Thummim”? Joseph Smith possessed at least two seer-stones before he recovered the Book of Mormon plates in 1827, and these stones were markedly different from the Nephite “interpreters” that Joseph Smith received later. What the Book of Mormon calls “the interpreters” (Mosiah 8:13, 19; 28:20; Ether 4:5), and what we might traditionally think of as the “Urim and Thummim,” were a special set of seer-stones that consisted of two transparent stones set in a “bow,” which would have resembled a large pair of eye-glasses, and which were apparently somehow attached to a breastplate, much like the biblical description of the priestly Urim and Thummim. This set, buried by Moroni with the gold plates, seems to have been barely used by Joseph Smith. In actuality, the phrase “Urim and Thummim” for seer-stones and the Nephite interpreters did not even begin being used until a few years after the Church was founded. The referencing of both Joseph Smith’s seer-stones and the Nephite “interpreters” as “the Urim and Thummim,” which has been done by both early and modern members of the Church, has led to some historical confusion.